The Chicks that Click Photography Club met in Trenton on Saturday, July 27, for an HDR (High Dynamic Range) Workshop. The instructors were Steve Rich and Jimmy Batte from Aiken HDR. After several hours of classroom instruction, the photographers loaded into golf carts and Gators and enjoyed a photo shoot in downtown Trenton which included Trenton United Methodist Church, The Episcopal Church of the Ridge, the old yellow store building, several lovely homes on Wise Street, and Ebenezer Cemetery. 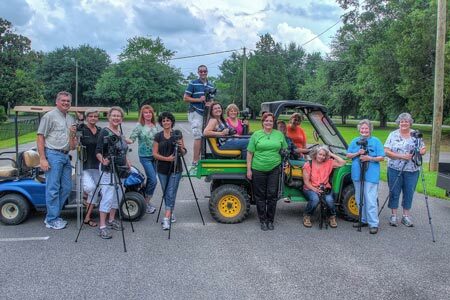 The Chicks that Click Photography Club has approximately 30 members from the CSRA. They meet monthly at Sweetwater Baptist Church Family Life Center. 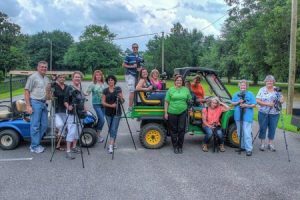 3 Responses to "“Chicks that Click” Photography Club Invades Trenton"
Thank you Pam Cook and the Edgefield Advertiser for the article, thank you to the town of Trenton for allowing our group to the opportunity.